If you have a child that is interested in basketball regardless of age, youth or high school, have them check out our intro basketball videos in the right column of this page. Our site has a tremendous amount of info so please read through the information on the Pride tab. Can't find what you are looking for? Just email us and we'll be happy to chat with you. 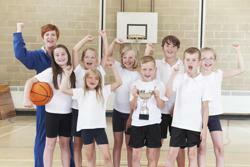 Basketball is a fun and affordable sport for your child to get involved in. Don't worry if your kid has never played, with our high-level coaching, kids will learn technical skills and strategy within their first year of joining our program. Costs will range based on your play in our recreational or competitive program. Fees will go towards covering court fees, tournament costs, traveling and lodging. Each season may have differing fees based on the activities we will be involved with.